I’ve heard the argument that printers aren’t necessary in our digital world, but that couldn’t be farther from the truth. With a constant move to smaller, heavily modified photographs online (think Instagram’s 640px standard image and default set of filters), a printer is the best way to truly evaluate one’s photographic skill. Even a high-res monitor can’t compare to holding a print in your hands and looking at it under different lights. The various technologies inside today’s enthusiast and professional printers are astounding. While they might look dowdy on the outside, inside there’s a veritable Willy Wonka of technology that makes the output from a printer look more like film output than ever before. Print heads have improved radically, and printers now include a variety of mechanisms to sense and prevent ink from clogging—a serious improvement for anyone who’s not constantly churning out enough output to keep the print heads from gumming up like Krazy Glue® when it sits idle. The new Canon imagePROGRAF PRO-1000 has 27 different temperature sensors that help the device keep ink flowing. Clogged nozzles require a heavy cleaning cycle, which wastes huge amounts of ink and often has to be repeated to clean a print head. The Canon PRO-1000 takes this a step further and can sense when one of the nozzles is clogged, automatically replacing it with nearby nozzles and preventing gaps in coverage traditionally caused by clogged nozzles. Printers also have to lay down their ink in an incredibly precise pattern in order to get the sharp coverage you’d expect from a professional device, and that technology has improved, as well. To drop ink in the right place, it’s necessary to move the print heads in precise increments. That’s why the resolution of a printer (the 2400×1440 dpi number) isn’t the only thing that determines the quality of an image. If you lay any of 2400 microscopic droplets in the wrong place, you get a blurry image. Printers have to precisely evaluate the width and thickness of paper, and adjust for different surface types and coatings (that’s why you select different paper profiles in the print dialog box). The inks themselves have improved, too. You’d think that the cartridges just contained the printer equivalent of the ink you find inside a pen, but that couldn’t be farther from the truth. Printer ink is a technological marvel, with each droplet of ink encapsulated in order to keep it from spreading away from where the printer wants the ink to go. Different printers create different-sized droplets, and the ink-spraying technology of the heads allows them to produce infinitesimally small drops. Epson’s SC-P600, for example, creates droplets as small as two picoliters—that’s so small it’s visible only under a microscope—and the printer creates billions of these drops of ink for a standard page. Paper technology has improved, as well, with the major paper manufacturers creating ever-refined coatings to better control the spread (or the lack of spread) of the ink. Professional photo luster, gloss and matte papers have improved greatly in recent years, but probably the most impressive improvements have been with rag papers. These natural-fiber papers have traditionally been difficult for the photographer to use. Ink commonly bleeds in rag paper, but newer coatings on the surface hold onto the ink. Like a Thomas® English Muffin, the nooks and crags in the coated surface of rag papers hold onto the droplets so they only go where they’re indented to go. 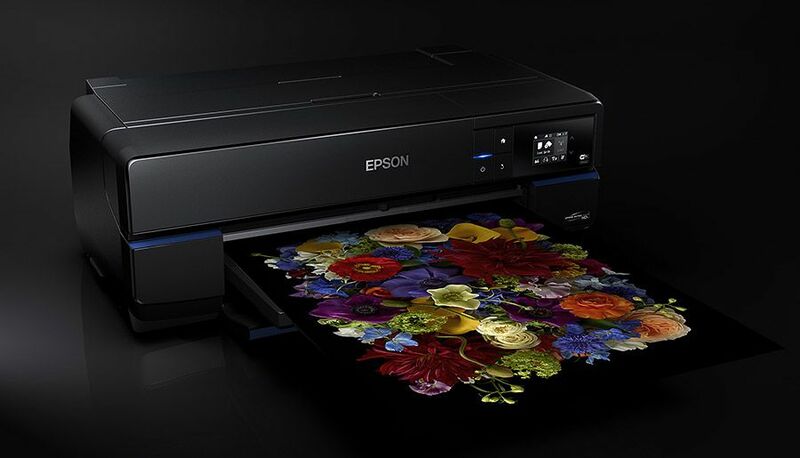 Both Epson and Canon have released new printers recently, which use the latest technologies to create exhibition-worthy prints—even if you’re only going to exhibit them on your walls. Epson’s new P400, P600 and P800 replaced the venerable Stylus line of printers, and Canon’s aforementioned imagePROGRAF PRO-1000 is a hybrid of their enthusiast printers and top-end large-format devices. We tested the new Epson and Canon units to evaluate them for the enthusiast and professional printer, and both are the best printers either company has ever made. The P600 is the middle-sized member of the SureColor family, creating 13×19-inch borderless prints with output as high as 5760×1440. The P600 uses a nine-ink UltraChrome HD inkset and has separate matte black and photo black inks. The P600 doesn’t have a dedicated channel for matte black and photo black, however, which requires several minutes and around three milliliters to switch between inks. The P600 has an optional roll-feed unit, which makes it valuable for the studio that cranks out prints or for the photographer working with panoramas. It can also print to DVDs and CDs. The P600 has WiFi connectivity, Apple AirPrint and Google Cloud Print (for printing straight from mobile devices), Epson Connect printing (for remote printing), USB 2.0 and Ethernet—it’s simple to configure the P600 in almost any environment. The 13×19 size of the P600 covers most photographic needs, while the P800 handles 17×22” output. The Canon PRO-1000 printer is a much more radical redesign than the Epson P600, as it includes many technologies that are new to Canon, such as a vacuum-assisted paper transport system, which can adjust to different-thickness papers and which Canon claims helps keep the paper in perfect alignment during printing. re’s no purging of ink between matte and photo jobs, which means no wasted ink. The printer also has a gloss coat that’s designed to reduce post-printing color shifting. The PRO-1000 has no roll feeder option, which makes it less versatile in a wedding or portrait studio where the more economical rolls of paper are used. The Canon PRO-1000 only comes in a 17×22 size.